Making plans to ring out the New Year without ringing out your wallet? Then you need to head to popular Dubai Marina hotspot, The Scene by Simon Rimmer, who are throwing a free-entry New Year’s Eve bash. The British eatery have decked their halls and trimmed their trees, transforming into a complete winter wonderland for the silly season, so you can still expect plenty of festive cheer as you say goodbye to 2018. 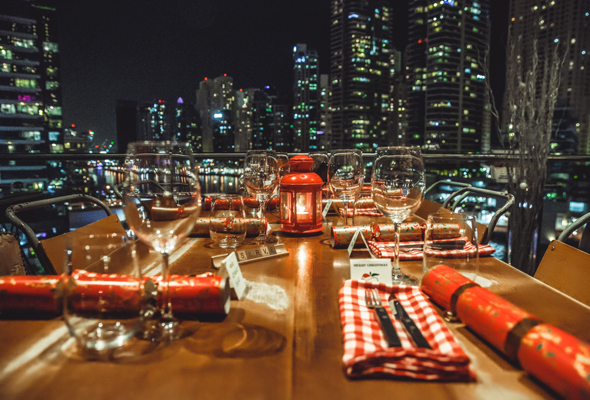 If you book in quick, you can bag yourself a table on the terrace, where guests can toast to the new year with twinkling Dubai Marina views, and even catch a glimpse of the JBR fireworks as the clock strikes twelve. Dishes can be ordered from the a la carte menu at leisure, with nostalgic British dishes such as steak and ale pie, fish and chips, and a curry of the week all on offer. There will also be deals on bottles of bubbly, which will be priced from Dhs199 and bottles of spirits from Dhs420 – perfect for toasting to 2019 with friends and family.